Thank you to Sleep Number for providing me with a sample to review. All opinions are my own. When it comes to sleep, there’s nothing I covet more. I’ve always been a great sleeper and being a mom to young ones, good sleep has been hard to come by. That’s why when Sleep Number approached me to test out their latest innovation, the DualTemp Layer, I leaped at the chance! The DualTemp is the newest sleep technology from Sleep Number. The DualTemp gives you and your sleeping partner the ability to control your sleeping temperature, from warm to cold at the push of a button! 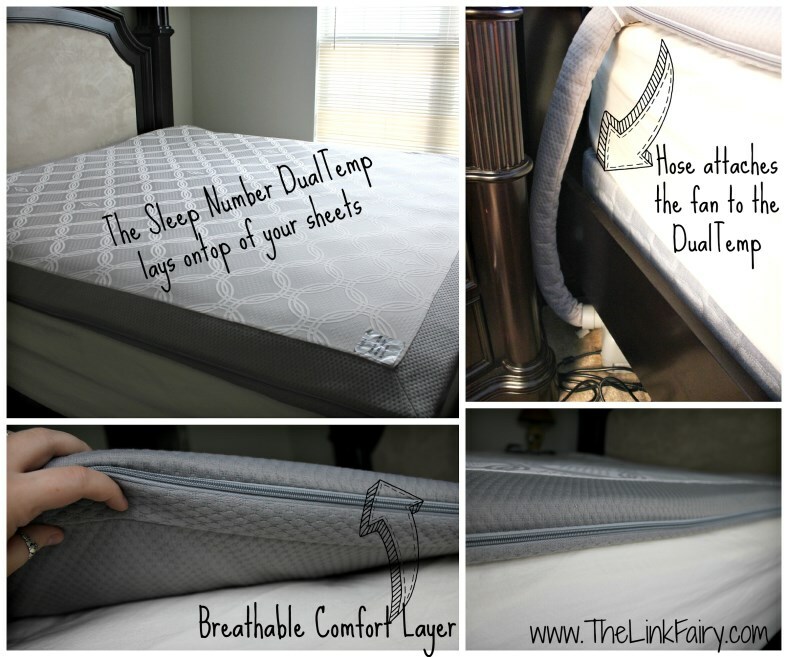 The DualTemp uses active air technology that heats or cools each side of the bed. No more chilly or uncomfortably warm nights with the DualTemp, just set your remote to your perfect temperature and dream away! 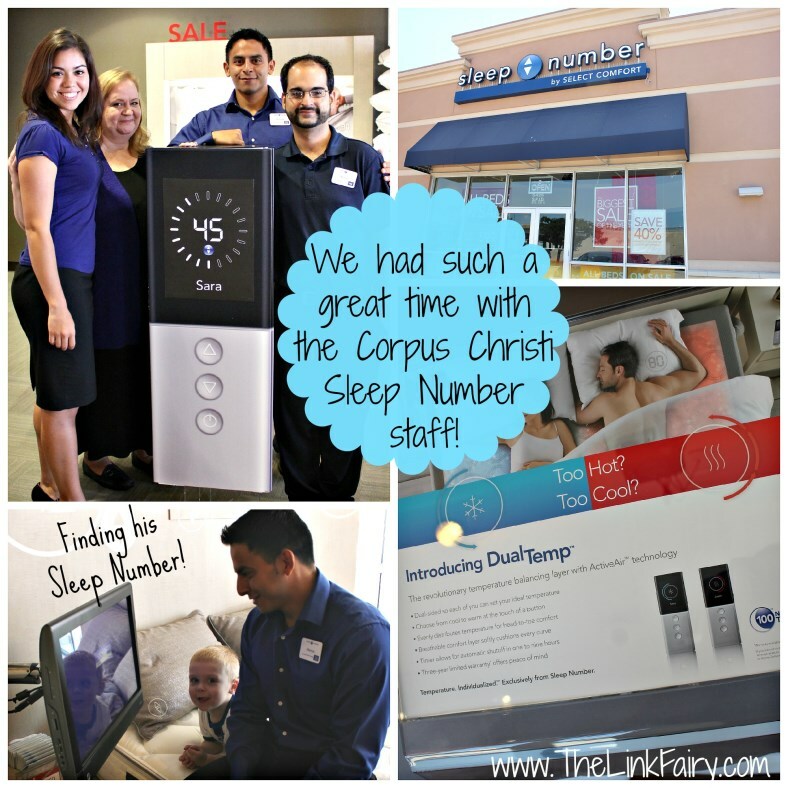 We started our DualTemp journey at the local Sleep Number Store in Corpus Christi, TX. The staff were beyond friendly and helped me learn all about Sleep Number and their products. I found my Sleep Number was 45 and even got to test out a few of their awesome pillows! It was so neat to be able to feel how Sleep Number beds adjust to your liking. I loved being able to test out each one, it really was a totally different shopping experience! We finally came to the store sample of the DualTemp and got to try it out for the first time. It was SO cool being able to feel the difference in temperature on either side of the bed. After testing out the DualTemp in the store, I couldn’t wait for ours to arrive! Finally after a week or so the box showed up and it was time to schedule my install. I called Sleep Number and they set me up with a time and date for their technicians to come by and install my DualTemp. The Sleep Number installation crew were wonderful! They showed up on time and ready to get everything set up for me. I was super surprised at how little time it took to get everything put together. They just took the DualTemp out of the bag, laid it on my bed and plugged in the two fans and hoses on each side. (Be aware: You do have to make sure there are two available plugs close to your bed on either side for the fans to be plugged into. ) They then helped me program my remote and the DualTemp was ready for a test run! I’ll admit, once the set up guys left, I just had to test out my new DualTemp! The kids and I all piled on the bed, covered ourselves with the comforter and waited for the magic to happen. I grabbed my remote and set it to the coldest setting. about 2 minutes later my 4 year old said, “Mommy, it feels cold!”. Indeed it DID feel cool! One of the most notable features of the DualTemp is that it’s completely controlled through a wireless remote. 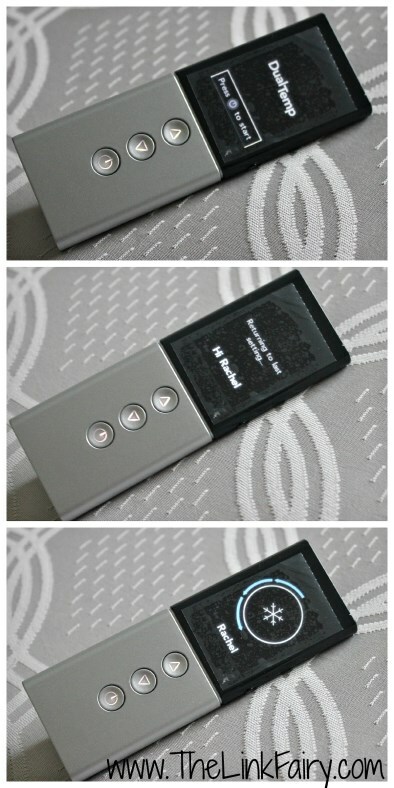 Each side gets their own remote, however only one remote can be personalized with a name. Both remotes have the ability to remember it’s last setting, go from cool to warm and offer a timer mode that goes up to 9 hours. In timer mode, the DualTemp will auto shut off and go into a refreshing cycle once the set time has ended. There are 3 possible settings for the DualTemp, cool, warm and fan. Using the fan option will take the air around you and circulate it through the DualTemp. That night was our first DualTemp test run! We both set our remotes to our favorite setting, which happened to be as cold as it would get. Being in Texas it’s HOT so the cooler we can get the better, especially when sleeping. Ever since moving to Texas my husband has complained about sweating in his sleep, which is in my opinion, is gross! So we were both hoping the DualTemp would be able to help. I set my timer for 8 hours and let it run. I must say, laying on the DualTemp is extremely comfy! It’s very soft and features a layer of memory foam. This is great for me since after having my kids, I have sensitive spots in my back that make it hard for me to sleep sometimes. After our first night my husband woke me up and told me that was the best sleep he’s had since we moved!! He said he didn’t wake up once from sweating and felt good and refreshed. I also felt great! My back didn’t feel tense and I didn’t toss and turn as much as I normally do. I’ll admit, before actually testing out the DualTemp in my own home, I was skeptical that it would be able to replicate what we experienced in the store but it’s been great! We’ve been sleeping on the DualTemp for a week and a half now and so far so good! We’re both much more comfortable at night and are sleeping better then before. 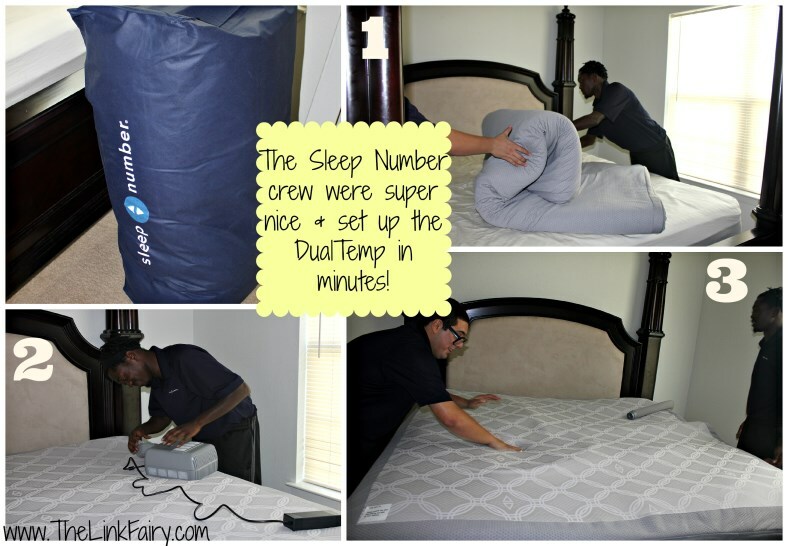 The DualTemp has been amazing, it’s given both my husband and I a level of sleep we’ve never experienced before! Choosing to add the DualTemp to your bed is definitely an investment with the king size having an $1899.99 price tag. That’s actually more then we paid for our king size mattress. It’s a decision that should be thought out carefully as should any large investment and should be weighed against how important your quality of sleep is to your well being. In my case, I feel it’s worth the money, especially since it’s helped my husband so much. There are a few things I would change if I could. I’m not fond of the fact that there’s no way to protect the DualTemp, such as having some kind of protective layer that could go over it. It can be spot cleaned if it gets stained, but having kids that like to visit us in our room, it would be nice to be able to have a covering over it. Also, It would be nice if there were elastic straps that would let me secure it to the corners of my bed. The DualTemp can get out of sorts while we are sleeping and needs to be smoothed out. It would be nice to have elastic corners to stop this from happening. Other then those two issues, I feel the DualTemp has lived up to our expectations! When it comes to advancing the way we sleep, Sleep Number holds the gold medal. From their amazing mattresses to their new DualTemp, Sleep Number truly is breaking new ground allowing us all to sleep better. With better sleep comes a better, happier person so it makes sense to spend time finding the best products to deliver the best sleep. 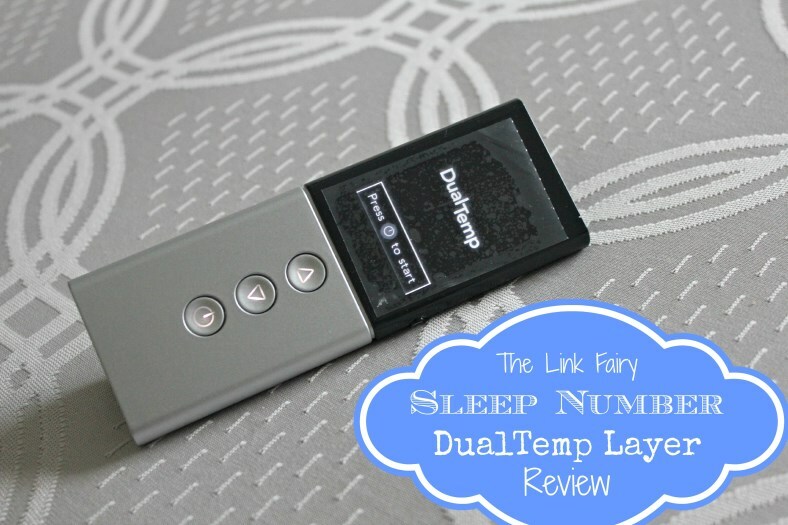 If you are looking to improve your way of sleeping and need a change in temperature, I highly suggest trying out the DualTemp Layer from Sleep Number! The King Size DualTemp Layer that we tested sells for $1899.99 with smaller models starting at $999.99, learn more at Sleep Number’s website! Be sure to follow Sleep Number on facebook and twitter to stay up to date on the latest products and promotions! WOw this looks so nice! Love the hot and cold setting as I am always FREEZING and my husband is always Hot!! Me and my wife were in the same boat as you. The problem is the heat setting will over power the cool setting if one side is hot and the other is cold. Also noticed th room was significantly warmer as the units put off heat. Also not good for the one who sleeps hot. Also the hoses are attached to the corners and this makes it hard to keep a fitted sheet on, as it can’t go under the mattress on th corners like it’s supposed too. That’s a bit annoying… I do believe if both sleepers wanted their sides to be the same it would probably be great. But when ones hot and the others cold I found it to be a huge waste of money. We stopped using ours after about 2 weeks. Thats pretty darn cool. I need temp settings on my bed! Great review! Richard and I are seriously considering a new bed, this one would be perfect. I tend to be hot and night and he tends to be cool, this would help us both get a better night’s sleep. That looks and sounds utterly comfortable. As tax time rolls in, I’m looking going to weigh my options of getting something like this or a new bed altogether. By the way, that headboard is beautiful! Thank you!! 🙂 It’s my husband and I’s first REAL bed lol.. we had just a mattress and frame before so it’s nice to have a real one now! When I went to the sleep number store to shop for my sleep number bed I tried the Dual Temp and loved it. It does get really really cold. This would be perfect for anyone who suffers from hotflashes. On my wish list! This would be perfect for my husband and I. He is always hot and i’m always cold. returning to your weeb ste for more soon. We’re a group oof volunteers and starting a neww scheme in our community. I actually went in to the new store here and tried this and I really love it. It feels so refreshing on a hot day. I think it would be great if you could cover it with a sheet. The bizarre and impractical delivery of sucrose was both inconvenient and messy, yet I am certain I left pounds of spent wax in my five year old wake. for example, made regular beds uncomfortable. Wow, sounds like this would be worth investing in because in my opinion these days a good night’s sleep is priceless! My husband and I are both different in temp choices, he’s cold I’m cool! This would provide the perfect temp for both of us at the same time for peaceful restful sleep. I like that it has three settings, especially the fan choice. Thank you for an honest review and I’m with you on the straps and protective covering as well. We purchase a dual temp layer after a demo in the store. The shipping was rather expensive but the three year warranty is handled in home if there is ever an issue. Unfortunately when we received the shipped product, we did not experience the air flow the demo model produced but it worked fine for about 7 months without issues. We noticed that the internal foam pad was starting to bunch up and suspected that it may be blocking the hose, but they are in two separate compartments so that is not the case. Currently the product is operating at less than 50% efficiency from the original performance and air is barely circulating through the pad. The filters are clean and there is good airflow entering the hose. Shipping was $99 but the financing made the purchase easy to stomach. The 36 month warranty is a definite plus giving you peace of mind.